Managers need skills that help them excel in their roles, support organizational strategy and solve business issues. Legal information professionals look to the AALL Management Institute to gain a competitive edge and improve their professional acumen. From engaging staff for high performance to building partnerships, this three-day institute will take your management skills to the next level. 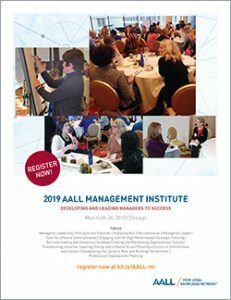 The AALL Management Institute prepares managers to handle staff development, manage conflict, build commitment to strategic goals, and equips them with managerial leadership practices that impact culture and and inspire change. Managers (including aspiring managers) will have the opportunity collaborate with colleagues from across the country, learn in a small group setting, and develop techniques that have long term value and impact. MAUREEN SULLIVAN is an educator and organization development consultant whose practice focuses on the delivery of consulting and training services to libraries and other information organizations. She has extensive experience as a consultant on organization development, strategic planning, management skills development, leadership development, introducing and managing organizational change, organization and work redesign, establishment of staff development and learning programs for today's workplace, revision of position classification and compensation systems, and the identification and development of competencies. She is a past president of the American Library Association and two of its divisions, ACRL (Association of College and Research Libraries) and LLAMA (Library Leadership and Management Association). Maureen designs and presents workshops and leadership institutes on topics of current relevance to librarians and library staff. Recent topics include recruitment and retention, generational synergy, transforming libraries, creating a collaborative workplace, and new approaches to performance improvement. She has presented several programs at AALL conferences and institutes, including AALL’s Management Institute. Maureen has served as a consultant to libraries including Vermont Law School, Harvard Law School, the University of Connecticut Law School, Georgetown University Law School, and the Boston College Law School. She serves as faculty for the annual Harvard Leadership Institute for Academic Librarians (LIAL) and is a professor of practice in the new Ph.D./Managerial Leadership in the Information Professions program at the Simmons College Graduate School of Library and Information Science. She received her MLS degree from the University of Maryland. Registration is $875 for AALL members. Registration is $1312 for nonmembers. The institute will run from 8:30 a.m. to 4:30 p.m. on Thursday and Friday. On Saturday, the institute will run from 8:30 a.m. to 3 p.m. Participants are expected to arrive on time and stay for the duration of the sessions. Continental breakfast will be served at 8 a.m. Institute materials, continental breakfast, break, and lunch each day are included. Registration is first come, first served, and limited to 50 people. Participants are responsible for covering transportation and housing. By attending the conference, you agree that AALL, its employees, contractors, and volunteers, may photograph, videotape or audiotape you during the conference and related activities. Your photo, video, audio, likeness, or image may be used by AALL for promotional or related purposes with no remuneration to you. Attendees are expected to follow the rules outlined in AALL’s Meetings and Events Code of Conduct. AALL negotiated a block of hotel rooms at the Hotel Palomar at a discounted rate of $189 single/double per night for institute participants. It is important that institute participants stay within this hotel block of rooms to ensure easy access to institute activities and networking opportunities. To make a reservation, contact the Hotel Palomar reservations number at 877.731.0505 or reserve online and let them know you are with the 2019 AALL Management Institute. The deadline for making your housing reservation is Sunday, February 24, 2019 (11:59 pm CDT). Rates will be available to participants three (3) days prior to and after the institute(based on availability). A credit card will be required to hold your reservation but will not be charged until checkout. In the event an attendee must cancel, he or she must do so by contacting the hotel 72 hours prior to arrival to avoid penalty of one night's room and tax. No-shows will also be charged for one night's room and tax. Check-in time is 3:00 p.m. Checkout time is 12:00 p.m.
Payments will be accepted via check or credit card and are due in full by February 25, 2019. You may cancel your program registration in writing by February 25, 2019 via email to prof-edu@aall.org. You will be refunded your registration fee minus a 15% administrative charge. Any cancellation requests received after the deadline will not be eligible for a refund. No-shows will not be eligible for a refund. Substitutions are welcome as long as the written request is made by the registration deadline. This continuing professional education opportunity is sponsored by the American Association of Law Libraries. The AALL Management Institute, instructed by Maureen Sullivan is a front-row seat to a master in action. While her bio states that she “is an organization development consultant,” she is absolutely an expert in this area who also understands the challenges of libraries. Sullivan’s high-quality programming, coupled with the facilitation of both individual and group work is exactly what every manager needs, regardless of time in the field. The program is designed to inform and plan for future action within your respective organization. I came back to my own organization re energized with new ideas to truly support and promote the law librarian profession. Phenomenal institute! Maureen Sullivan is very skilled at running the meeting, and knows when to switch gears, and how to solicit participation from the group. The venue was perfect. Networking was great—very interactive, with lots of variety in the interaction—round tables encouraged small group discussion and bonding, role-playing, poster-boarding, large group Q&As. Lots of great material and really, a very full two days of intensive learning—I will be digesting what I have gleaned for many months to come. The handouts are a wealth of knowledge and experience crystallized into a full book that I now keep on my office desk; also many excellent reading recommendations about management theory and practice. The role-playing sessions were especially valuable—a good way to explore different ways of managing people and projects and to identify my own strengths and weaknesses. If you have the opportunity to attend the next AALL Management Institute, do yourself (and your institution, colleagues, and staff) a favor and sign up.